Our big girl turned six last week! At five, she still felt like my little girl, but at six she is decidedly a big kid and of course has her own ideas to match. 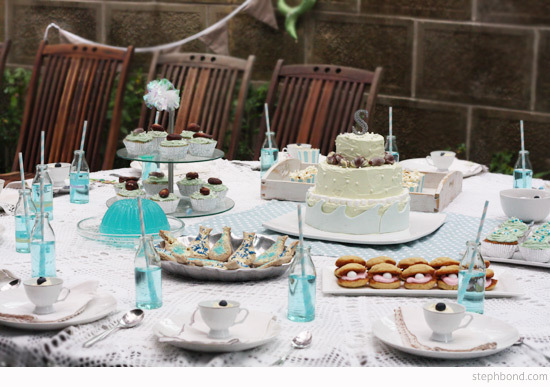 And as you know, mermaid parties are all the rage... so that is exactly what we created together for her birthday - a mermaid tea party for a small group of her girlfriends. Invitation: Jess from Joyess Designs custom-made a gorgeous printable invitation with a personalised mermaid to look just like our big girl. Cake: Made by me the day before the party. 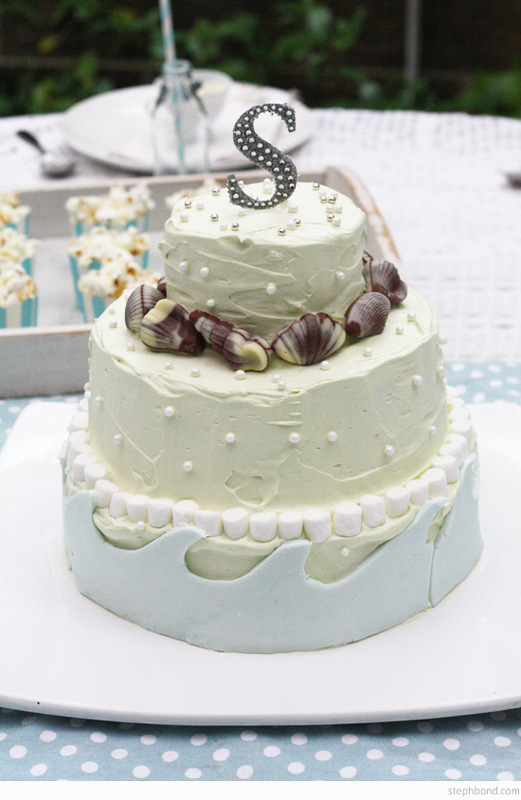 It was a three-tier, six-layer coconut cake with buttercream frosting, edible pearls, Guylian chocolate shells and fondant waves. It wasn't meant to be that big, but when I made the three layers they were kind of flat, so I doubled the recipe and made enough for four cakes. The recipe was the Coconut Layer Cake from the Edmond's Sure To Rise Cookery Book from NZ that my Mum handed down to me. Party food: All made by me. 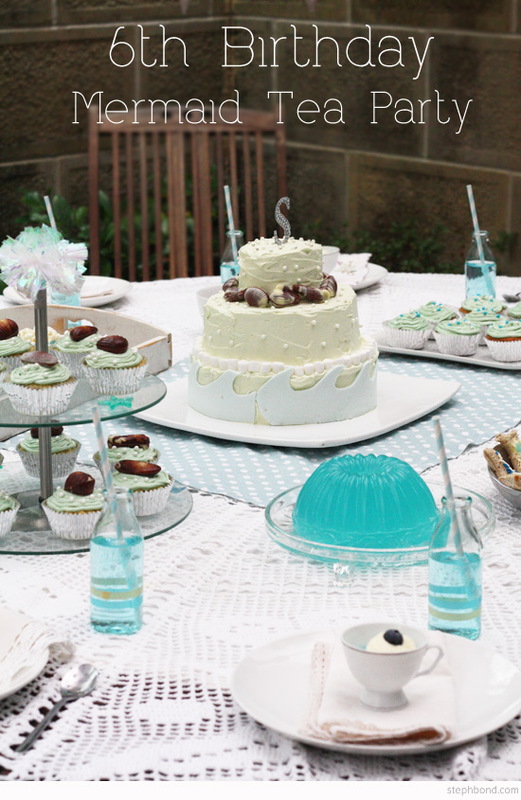 My favourite party treat? 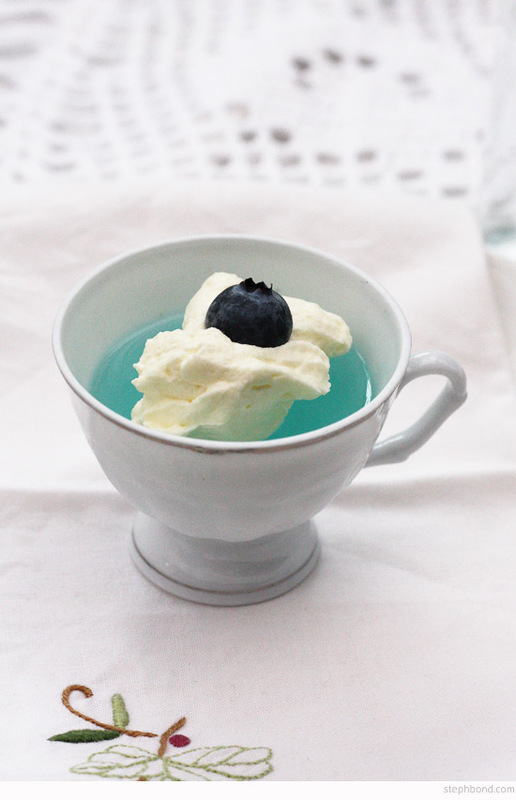 The blue jello/jelly! 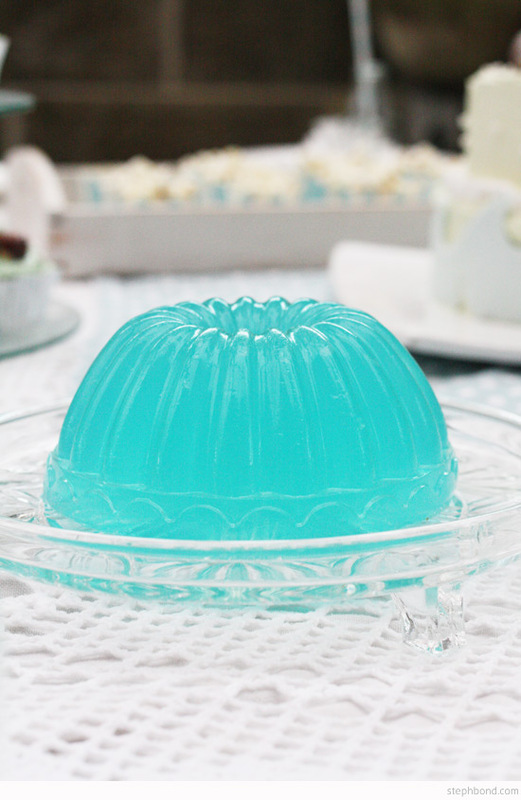 I made this jelly using a Miniamo jelly mould - the trick was to oil the inside of the mould for easy removal. It wobbled on the plate! 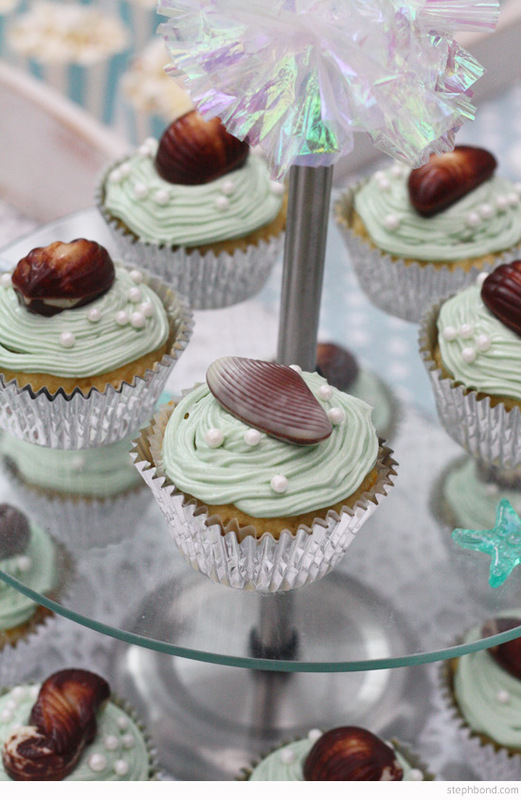 Lemon-coconut cupcakes with buttercream frosting, edible pearls and Guylian chocolate shells. 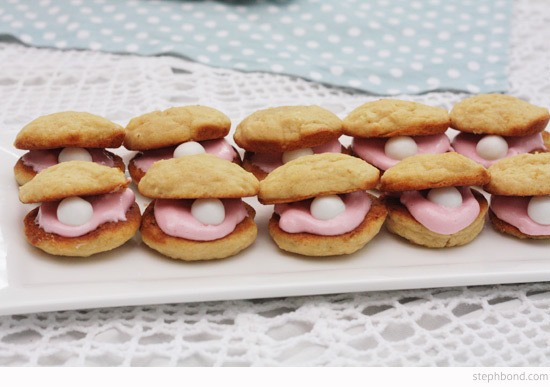 Oyster whoopie pies - I had seen this concept made with cookies on Pinterest, but thought that small whoopie pies would work well with a kool mint for the pearl. The mint tasted a bit strange together with the pie though! My Dad made fish-shaped (Tupperware cutter) fairy bread. 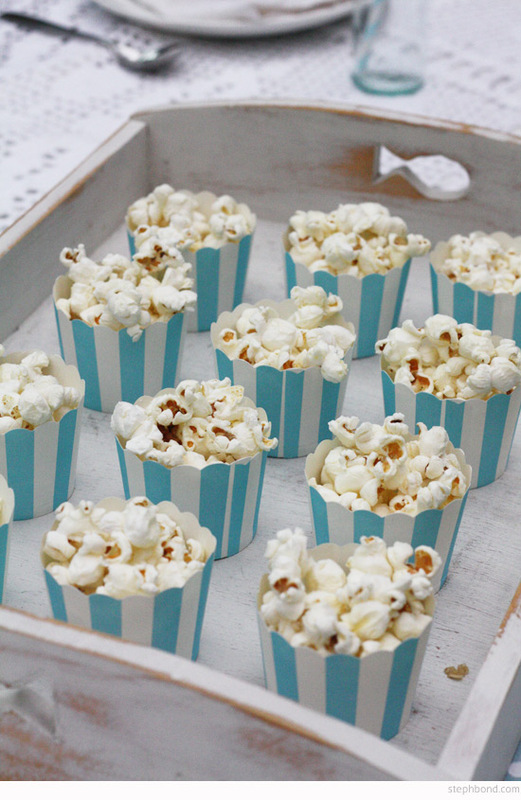 Popcorn in baking cups. 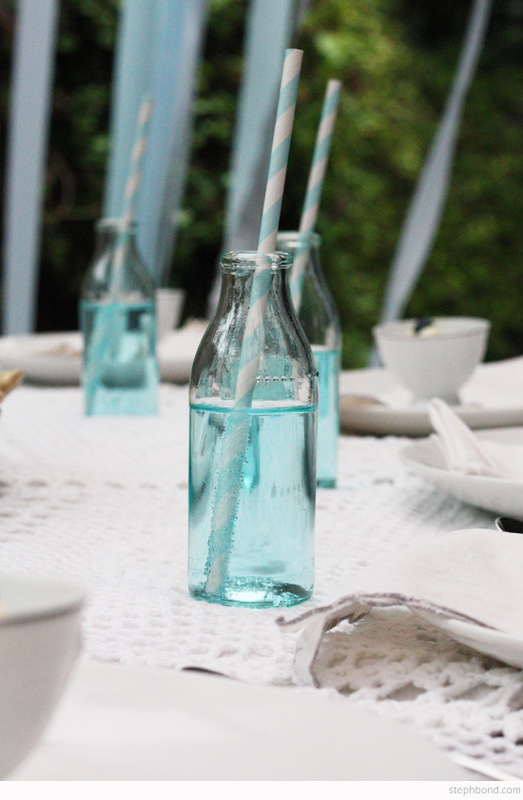 Drinks were mini juice bottles of lemonade (I added a teeny drop of blue food colouring to the jug). We also cleared the craft table and set up food for the adults (drinks, sausage rolls, pulled pork and coleslaw sliders, mini quiches, chips etc). 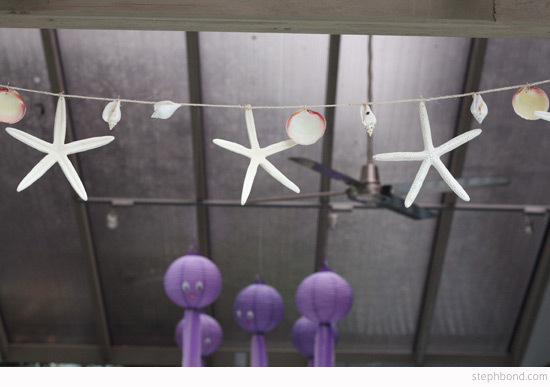 Decorations: My girls helped me make the fun purple octopuses. 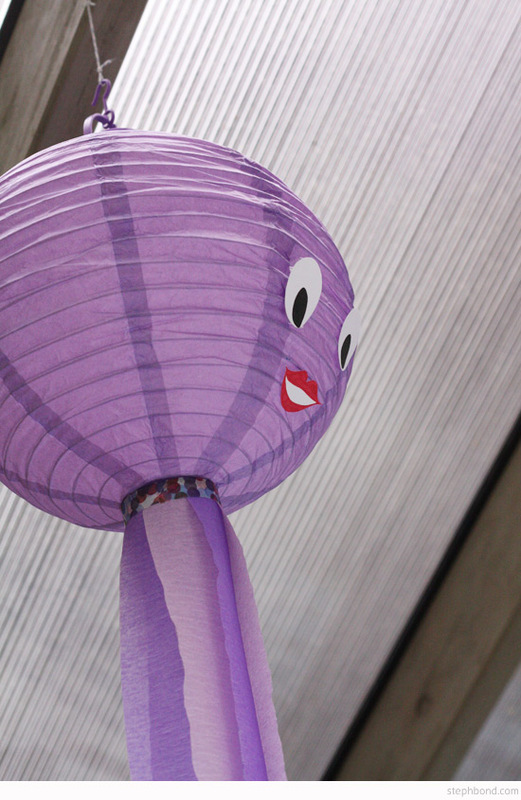 We bought purple paper lanterns and attached eight streamers for legs with washi tape. I painted and cut out eyes and mouth shapes to give them a little personality. 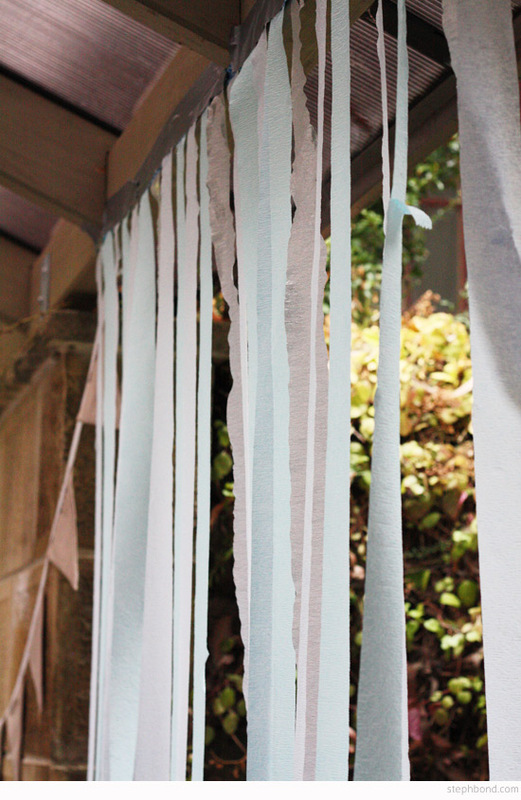 We also made a blue and silver streamer entrance to walk through. 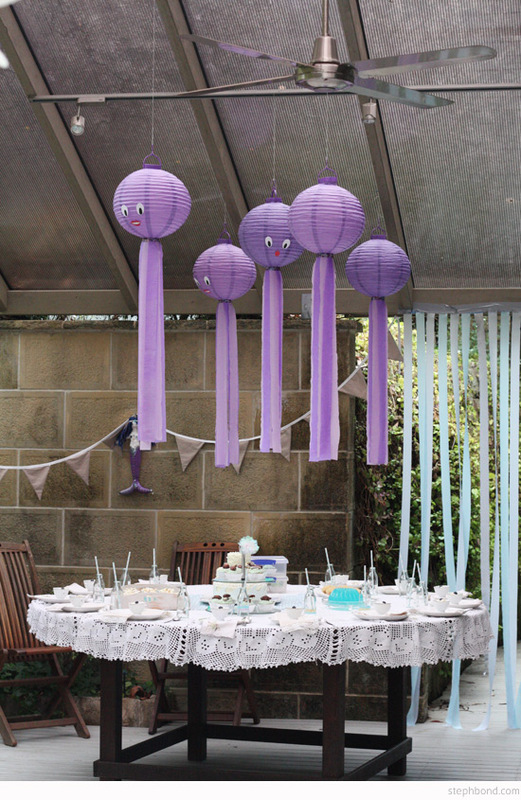 I re-used the fabric bunting that I made for my birthday party earlier in the year (made from a pattern from MyPoppet) and a shell garland from a trip to Hawaii. 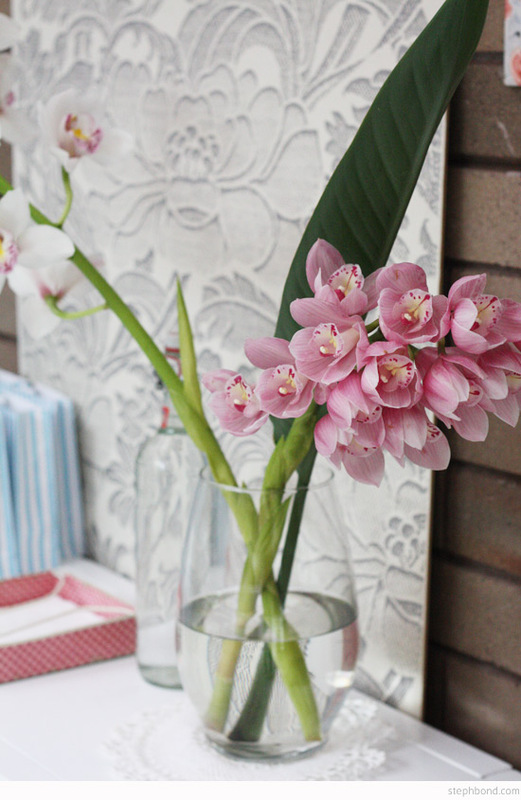 Our neighbour gave us gorgeous orchids from her garden which we displayed. 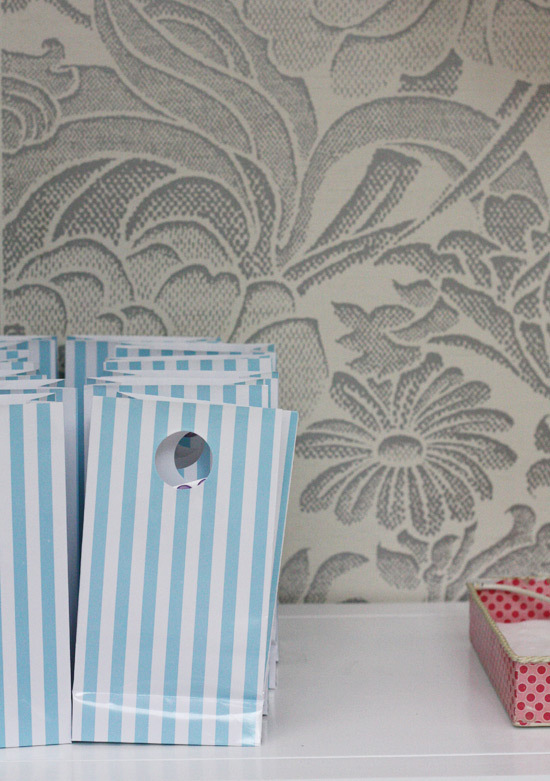 We also gave out minimalist goodie bags with a few blue-wrapped chocolates and lollies and each little mermaid received a shell necklace that we had bought in Hawaii. Birthday Girl Wears: Mermaid top and skirt by Lightning Bugs Lane on Etsy - a gift from my sister. Felt mermaid tail from The Lazy Owl on Etsy - a gift from my sister-in-law. 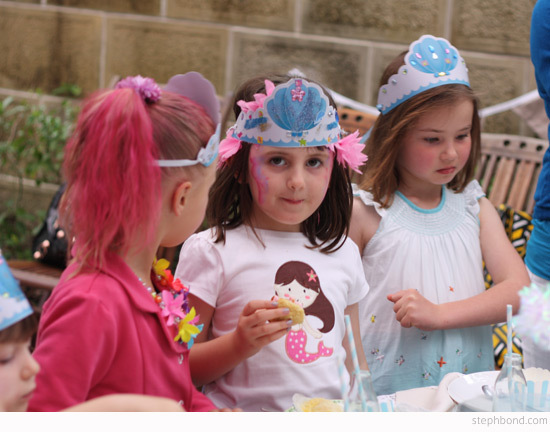 Games/activities: As soon as the girls arrived they decorated their own mermaid crowns (a free printable from Genevieve Gail). My Husband organised a treasure hunt with a treasure chest filled with play jewels and chocolate gold coins at the end of the clue trail. Our lovely neighbour also painted the girls' nails with non-toxic blue glitter nail polish (from Butter London). 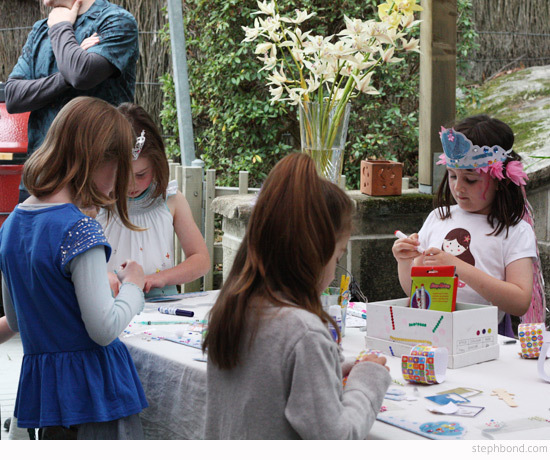 Otherwise the girls were happy to play with the girls' toys, eat and dance in the lounge. Tips: Start early! 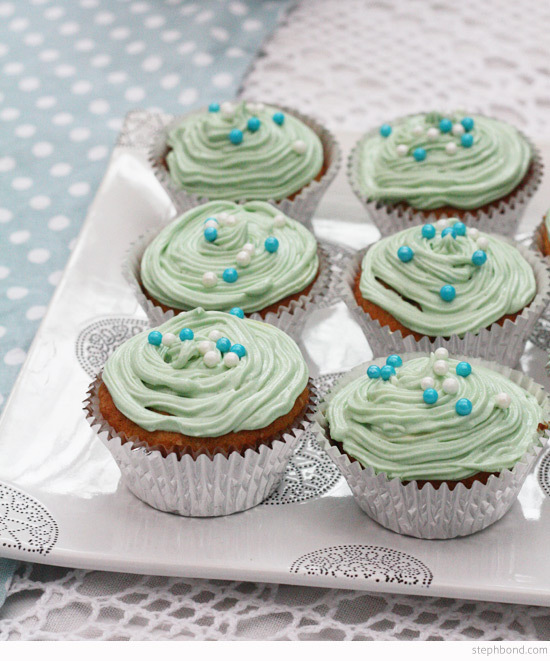 I made all the cupcakes two weeks ahead and froze them unfrosted. The octopus were made a week ahead. Delegate a few tasks - my Dad was chief dish-washer and I couldn't have made the amount of food that I did without him. My husband was in charge of music, drinks, games, and looking after the girls while I prepped. I also sketched out the party table ahead of time, set the table up a week ahead to practice and made a to-do list for each day leading up to the party. 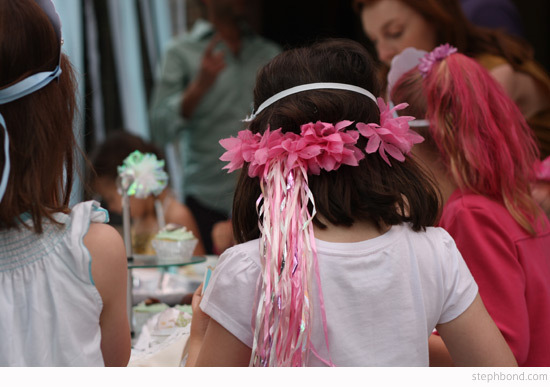 Something special: Rather than use disposable plates, cups and cutlery, we thought it would be special and grown-up for the girls to use the real thing. 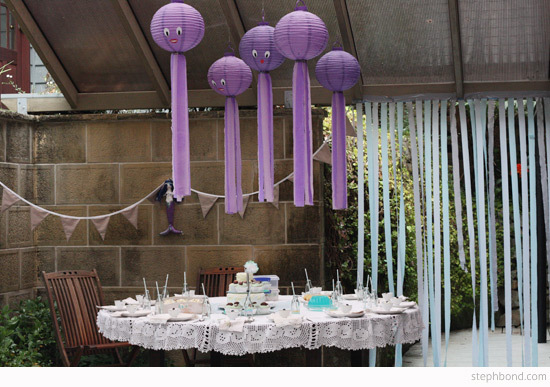 We set the table with a crocheted table cloth and our own plates, crochet-edged cloth napkins, forks, and mini juice bottles. 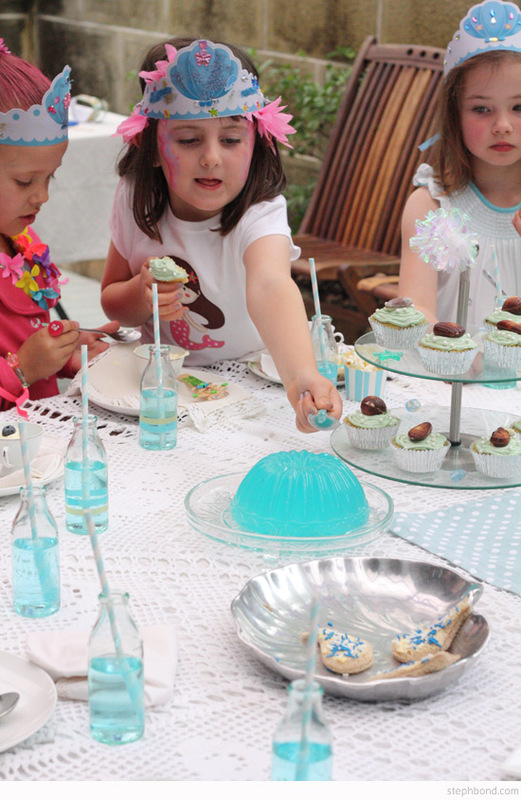 The clean up was minimal using the dishwasher, it saved us money, and looked sophisticated for a proper tea party. It was a special day to remember. 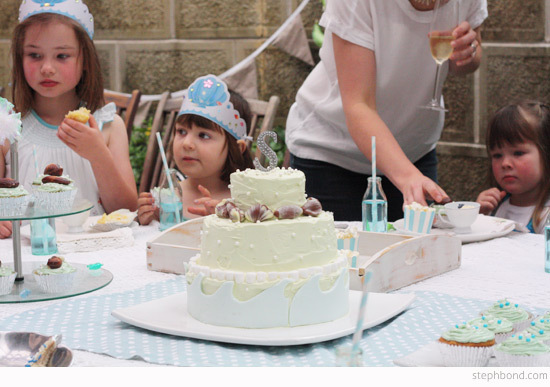 Huge thanks go to my family and our neighbour Emma who took some lovely photos and painted nails. 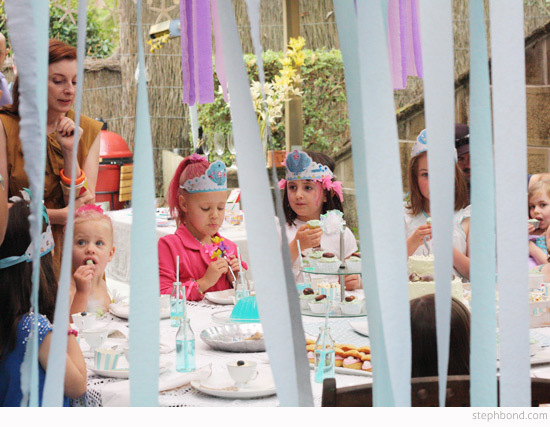 Head over to the Real Australian Kids' Parties section for more party ideas from Aussie Mums and right here for more Mermaid parties on Bondville. 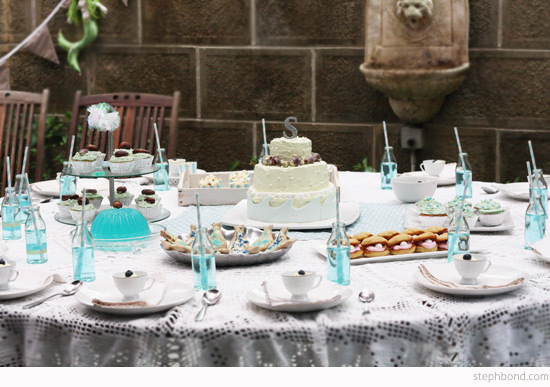 Adorable - looks like a wonderful party. Thanks Kim-Marie, Eli, Ellieboo and Anni - it was such a happy day.